University of California Press, 9780520260092, 320pp. The Greeks of the classical age invented not only the central idea of Western politics—that the power of state should be guided by a majority of its citizens—but also the central act of Western warfare, the decisive infantry battle. Instead of ambush, skirmish, or combat between individual heroes, the Greeks of the fifth century B.C. devised a ferocious, brief, and destructive head-on clash between armed men of all ages. In this bold, original study, Victor Davis Hanson shows how this brutal enterprise was dedicated to the same outcome as consensual government—an unequivocal, instant resolution to dispute. Linking this new style of fighting to the rise of constitutional government, Hanson raises new issues and questions old assumptions about the history of war. 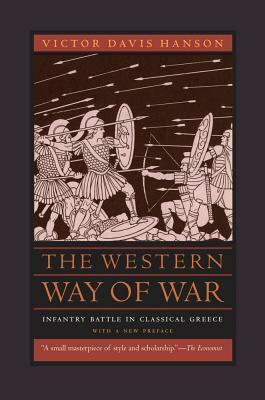 A new preface addresses recent scholarship on Greek warfare. Victor Davis Hanson is Professor of Classics at California State University, Fresno, and author and coauthor of many books, including The Landmark Thucydides: A Comprehensive Guide to the Peloponnesian War.